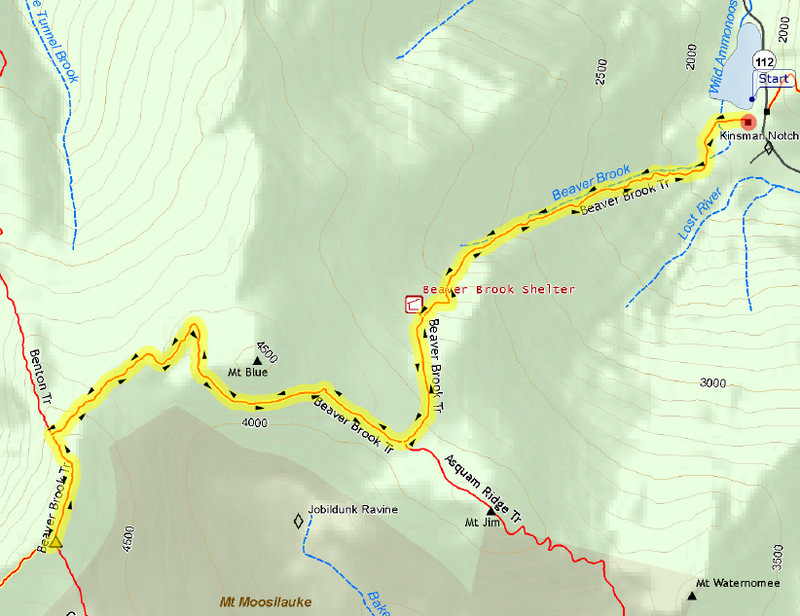 I had climbed Mt Moosilauke several times before, but always via some combination of the Gorge Brook Trail, Snapper Trail, and Moosilauke Carriage Road. But now I figured I was ready to tackle the "infamous" Beaver Brook Trail, the trail I had first read about in one of Mike Dickerman's books, possibly Along the Beaten Path. 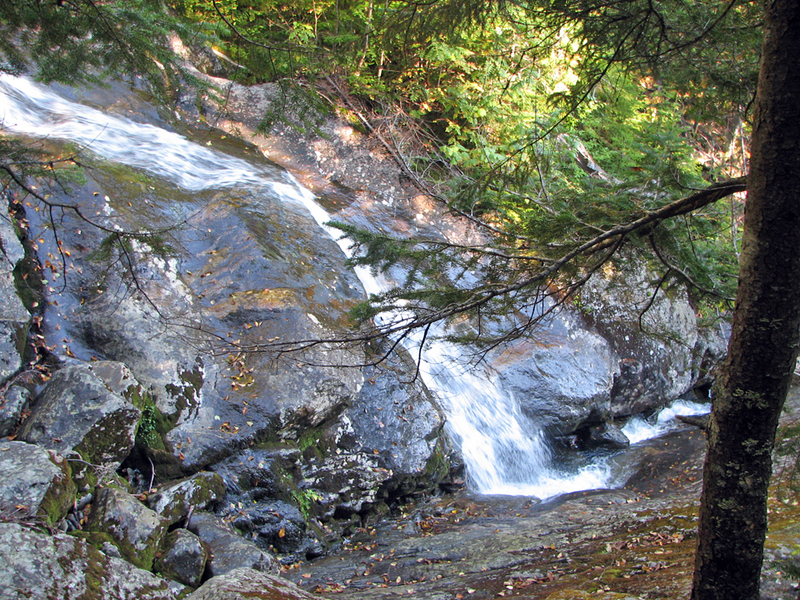 In one story,, he recounts unwittingly choosing the Beaver Brook Trail as his route up Mt Moosilauke on a hot summer day, not realizing how tough of a hike it was going to be. And then, not far from the trailhead, a warning sign seconds this sentiment. It reads "This trail is extrememly tough. If you lack experience please use another trail. Take special care at the cascades to avoid tragic results." The White Mountain Guide notes that "the section along the cascades is very steep and rough, making this trail the most arduous route to Mt. Moosilauke despite its relatively short distance, and then adds this caution: "In wet or icy conditions, this part of the trail may be dangerous." 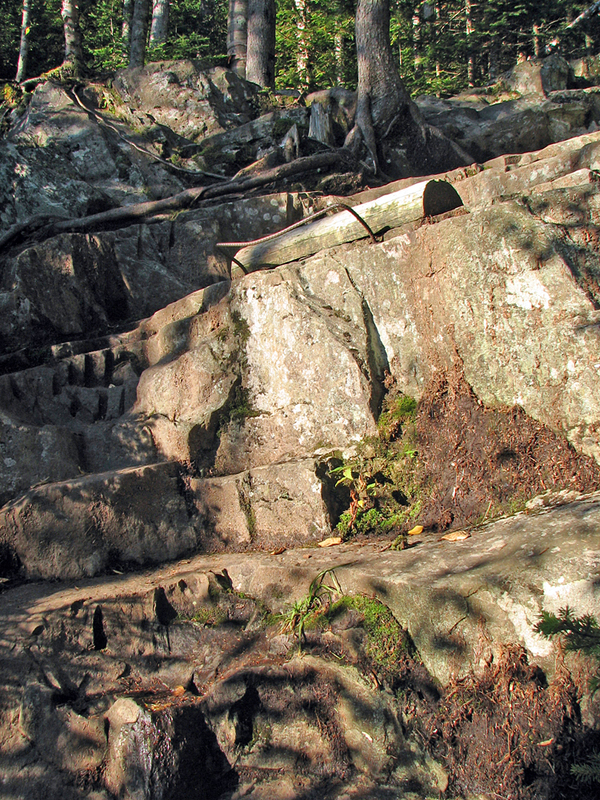 It also goes on to say that the trail "rises very steeply past the long series of cascades, with many rock steps, wooden steps, and hand rungs; in several places, the trail passes near the edge of steep dropoffs." So was I ready for the risk of "tragic results," the possibility of a "dangerous" trail with "hand rungs ... near the edge of steep dropoffs?" Hand rungs, of all things!! This was a new one. I began to image a White Mountain version of Italy's via ferratas, where iron rungs and steel cables provide protection on routes that would otherwise require technical gear. For all I knew, the iron rungs led straight up a sheer rock face. Actually, the better question was whether Patches was ready for this. There was no way she was going to ascend a 100-foot sheer cliff on nothing but iron rungs! Thanks to comments from View from the Top, I soon found out otherwise. The rungs didn't ascend staight up any cliff; in fact, there were only a few, placed for protection in icy conditions if required. 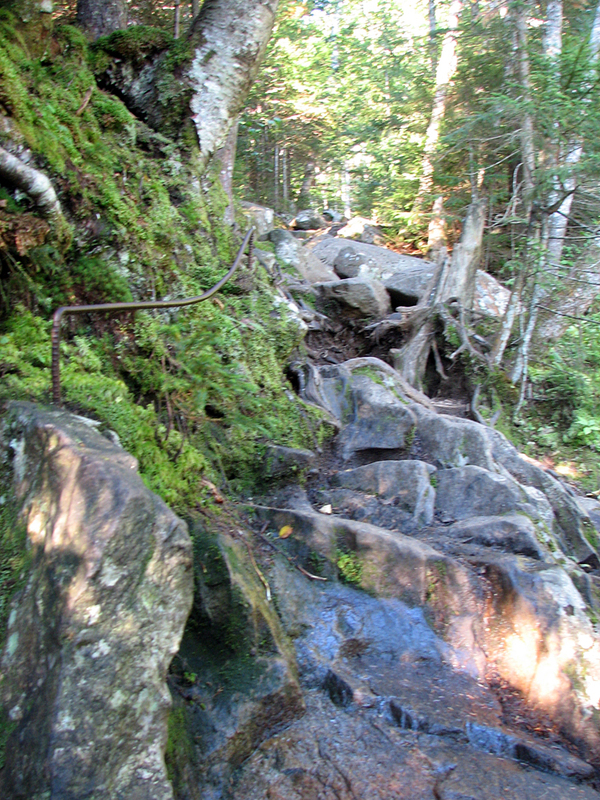 And, as usual on White Mountain Trails, dogs could just walk straight up the ledges with their built-in four-foot traction, especially dogs who were part mountain goat like Patches! The two of us had no problem negotiating the section along the cascades. In fact, this was the best part of the hike, very scenic and pleasant. We stopped several times to admire the views and take pictures. I didn't really need to use any of the hand rungs, but I tried out one or two just because they were there. 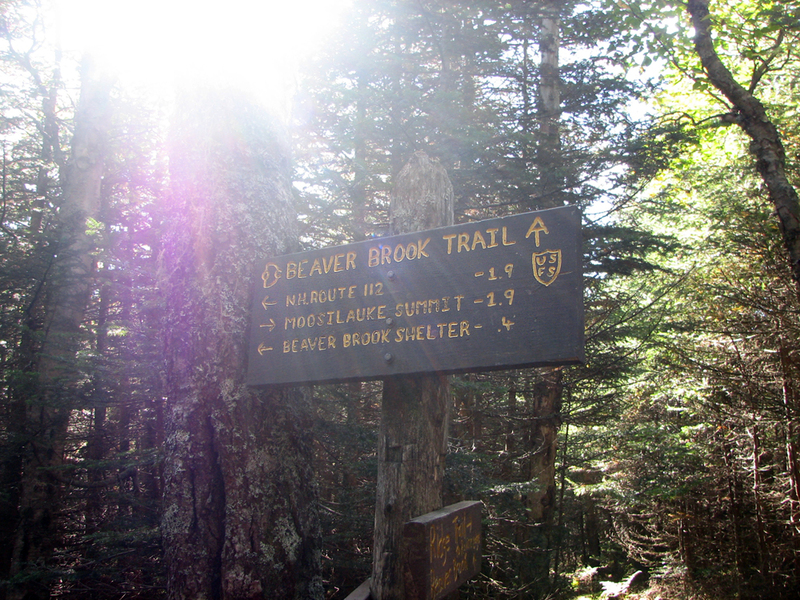 At the top of the steep section along the cascades, we took the Spur trail to examine the Beaver Brook Shelter. It was a good place to stop for a rest and a snack. Naturally though, Patches didn't touch the food I set out for her so I had to pack it back up as best as I could. Beyond the junction with the Asquam Ridge Trail, the Beaver Brook Trail, in my own opinion, began to get truly arduous, in that there were a number of short descents and climbs through rough and rocky cols that seemed to go on endlessly. I also expected to see a side trail or herd path to Mt Blue, but never noticed one. With little net altitude gain in the first part of this section and no landmarks I could be sure of,, I had no good way to gauge how far we had come or how much further we had to go to reach the junction with the Benton Trail. On straight steep ascents, I can just about pinpoint my location with my altimeter watch and the map, but that didn't work here. Finally though, the trail began to climb again and eventually we reached an area where we could look out over Jobildunk Ravine and up to Moosilauke itself. After a switchback and a bend to the left, we were walking along the headwall of the ravine, although there were still some minor ups and downs. This part of the hike finally came to an end when we arrived at the junction with the Benton Trail and we turned sharp left to make the final climb of the summit cone. Soon after passing a very worn sign announcing the alpine zone, we broke out onto the broad, rounded, and grassy summit area dotted with cairns to mark the path. The summit sign itself kind of sneaks up on you. Even though the grade is very gentle, the sign remains hidden by the curve of slope until you get fairly close. When we arrived, we quickly found out that we were not alone. The weather was nice and hikers (some with their dogs) were settled down in semi-comfortable niches all over the place, eating lunch, relaxing, and just enjoying the view. I put my pack down within the sheltered foundation of the old summit house. It wasn't very windy, but it was a good place to prop your back up against a stone wall. 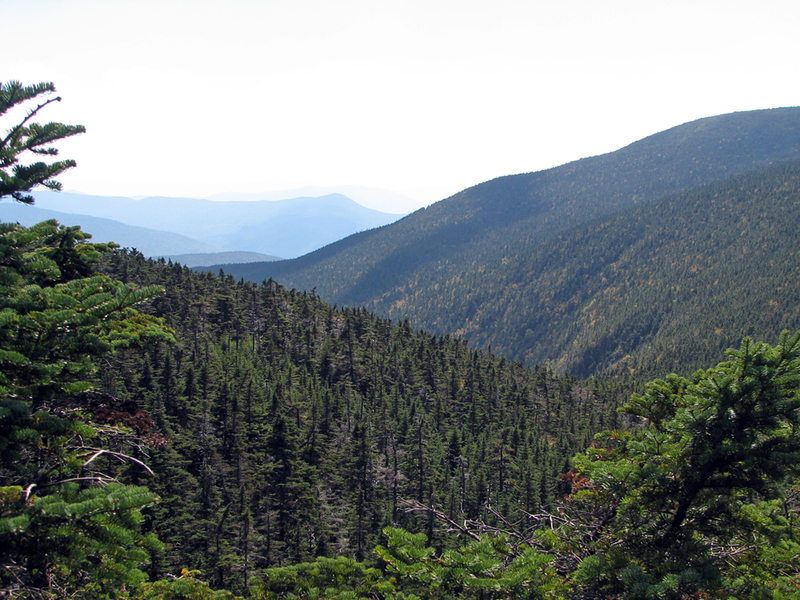 To the southwest, Moosilauke's South peak and the ridge connecting it to us poked above the contour of the summit cone. 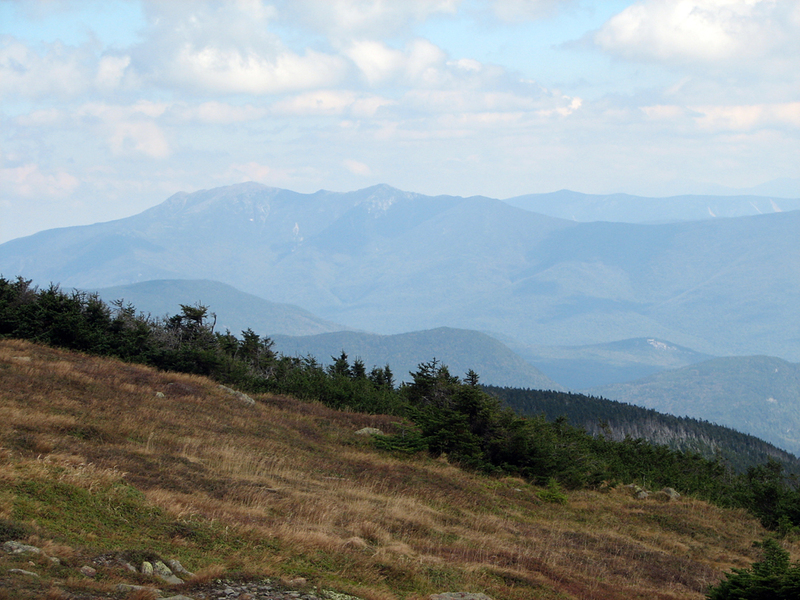 To the northeast, a hazy Franconia Ridge looked just about even with us. 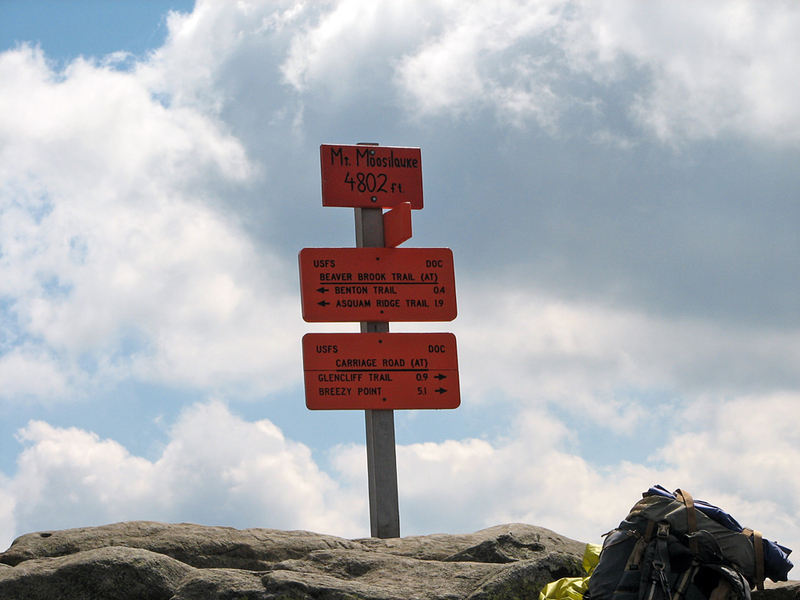 And just above where we were sitting, the distinctive bright orange summit signs were rather hard to miss. 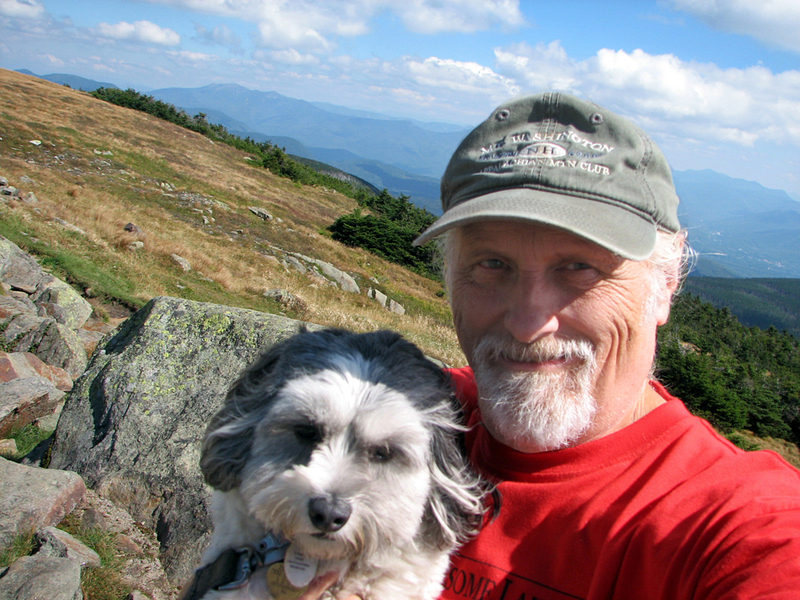 After gobbling down a power bar and muching on some Pringles, a few of which I shared with Patches, we headed up and just over to the other side the summit where I could take a better picture of the two of us. Of course, I had to take six or seven pictures just to get one where she was mostly looking at the camera, and where I wasn't blinking. Patches' attention was distracted by what everyone else nearby was doing. Before leaving, I considered taking the much gentler (and quicker) Carriage Road, Snapper Trail, and Gorge Brook Trail route down to the Moosilauke Ravine Lodge, and then calling for a shuttle back to our car, but I didn't want to take the chance that I wouldn't be able to get a ride or even make a phone call. At any rate, we made much better time on the way back, and didn't have any issues going down the steep section by the cascades. I was glad to have finally tackled this trail. Beaver Brook Trailhead just off Rt 112. I had read about this trail for years and was now ready to give it a try. Warning sign. It reads "This trail is extrememly tough. If you lack experience please use another trail. 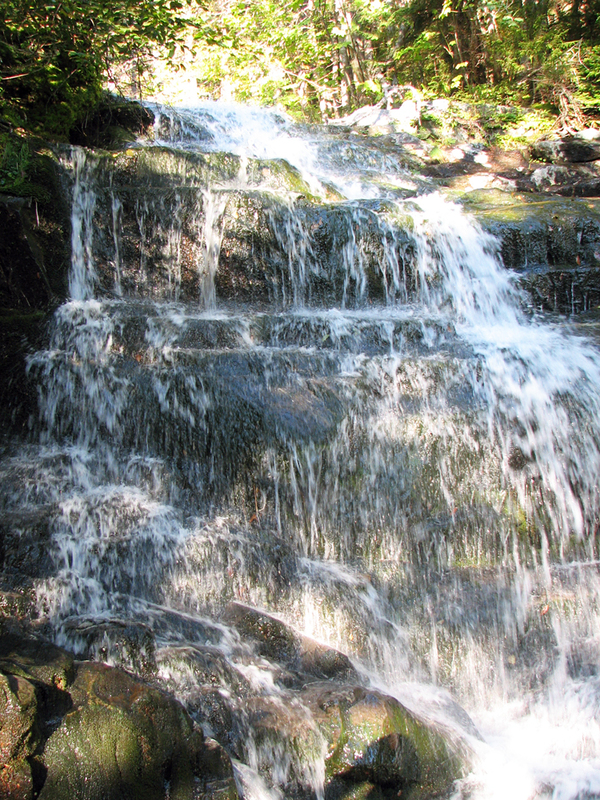 Take special care at the cascades to avoid tragic results." 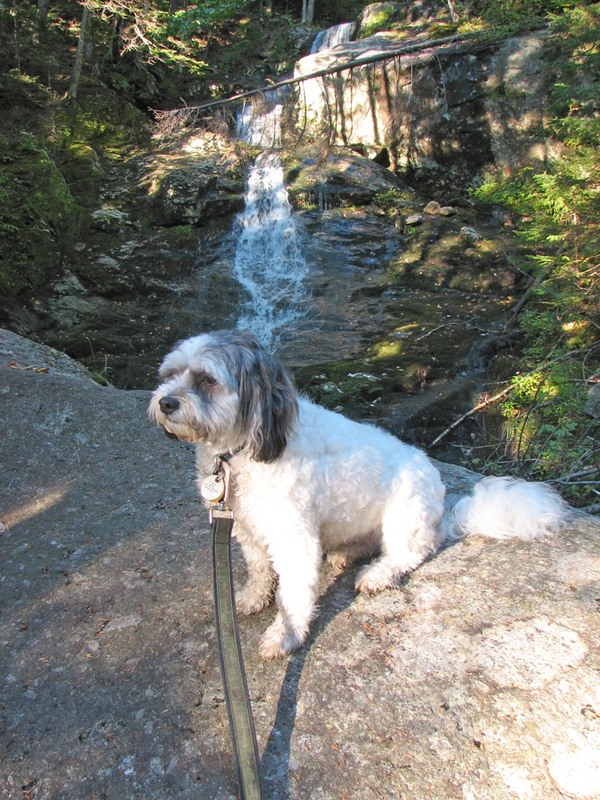 Patches sitting on a ledge in front of one of the lower cascades. A side view of the cascades just above the area in the previous picture. 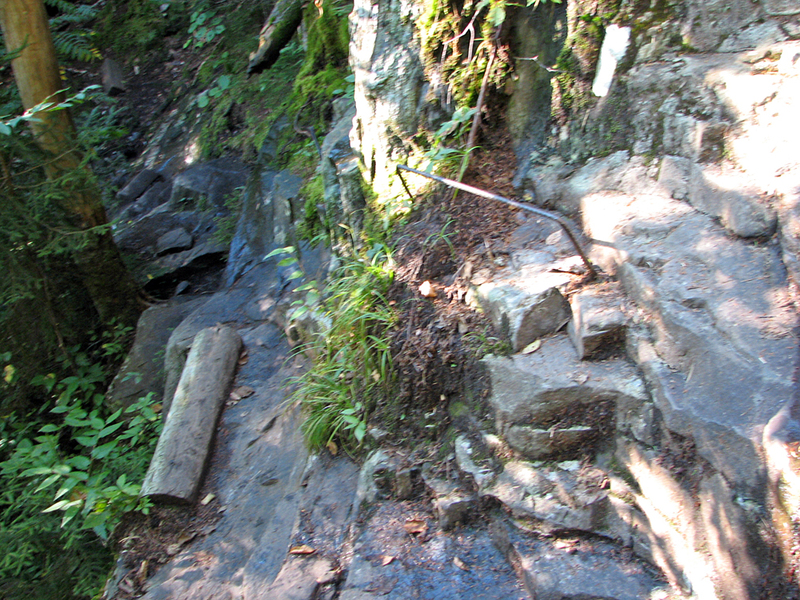 Section of the Beaver Brook Trail showing one of the iron rung handholds. 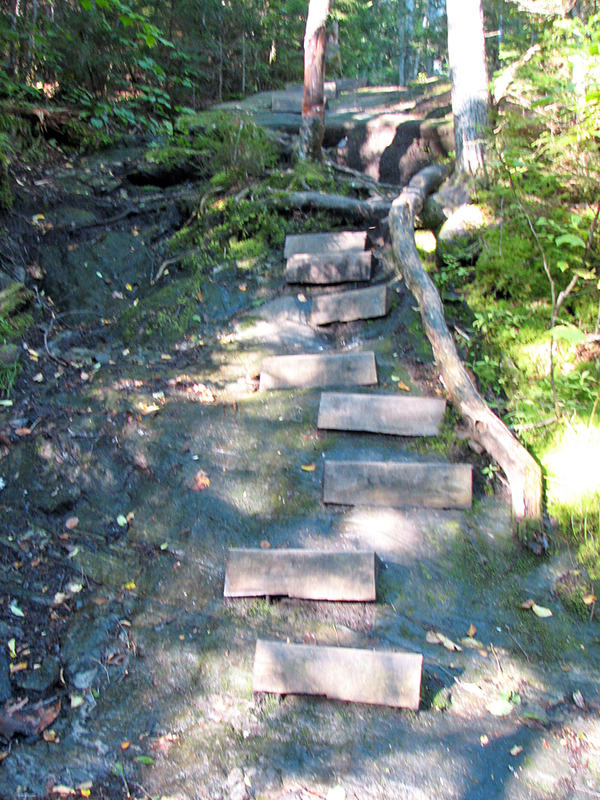 The trail runs right next to the cascades, so a slip here in icy conditions would not be good. The same section of the trail but looking downhill. Even on a dry day like it was that day, there are still some wet sliippery rocks. Another section of the trail with an iron handhold. I didn't really need these handholds on this hike, but they could come in real handy when there's ice on the trail. Pinned steps in yet another trail section. This spot was actually steeper than it looks in the picture. Cascades. I'm standing on the trail here, so you can get an idea of how close the brook is to the trail. 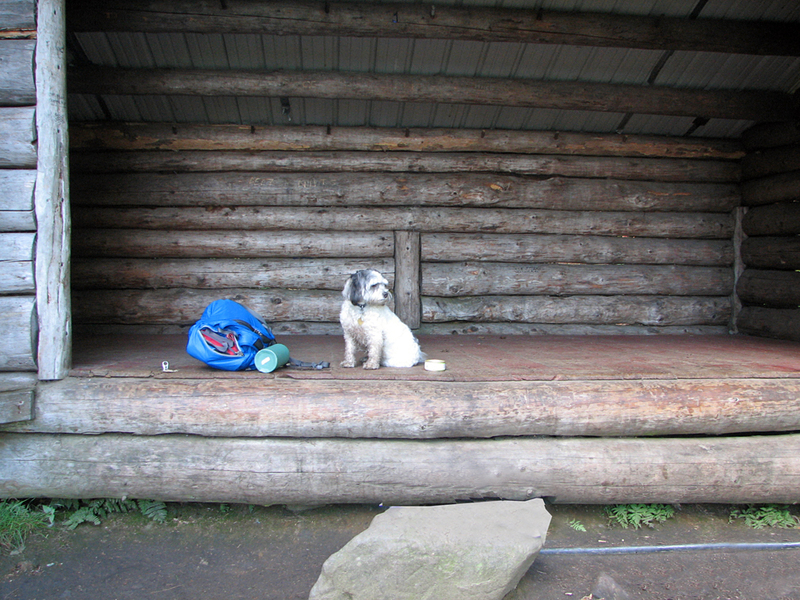 Patches sitting in the Beaver Brook Shelter. The shelter is at the top of the steep part of the trail. 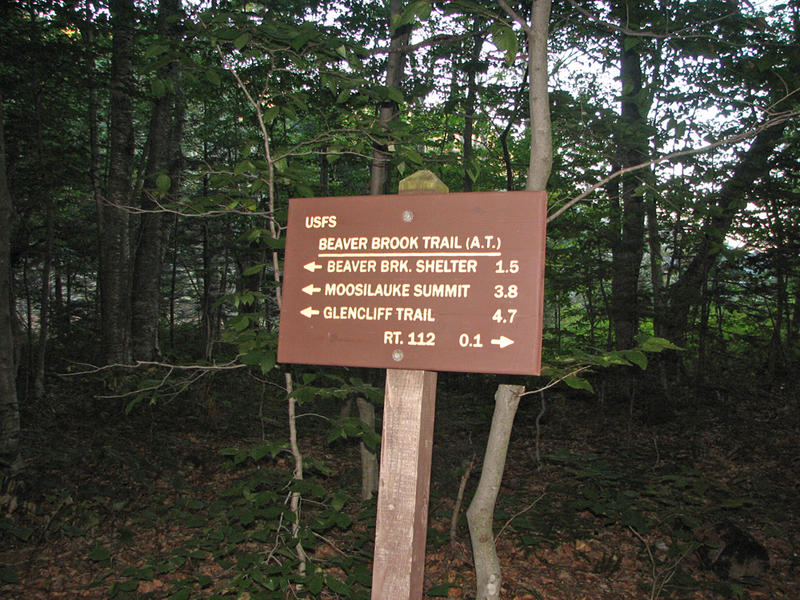 Trail sign at the junction of the Beaver Brook and Asquam Ridge Trails. Mileage-wise, this is the halfway point. 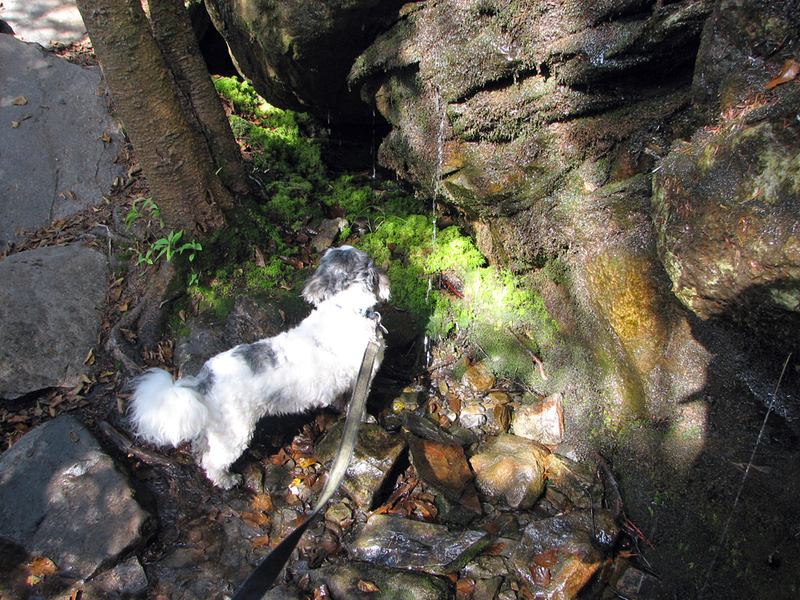 Patches getting a drink at a small col where springs drip from the cliff walls. 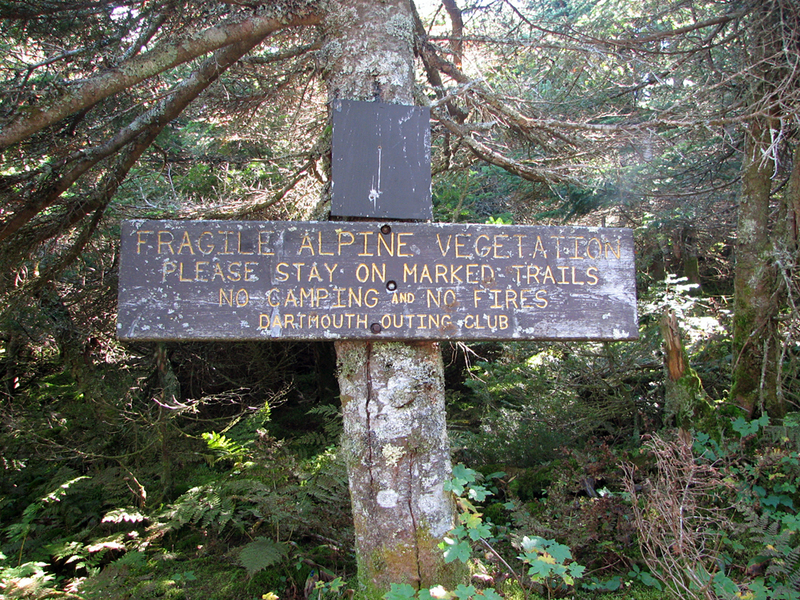 Alpine zone sign just before treeline. 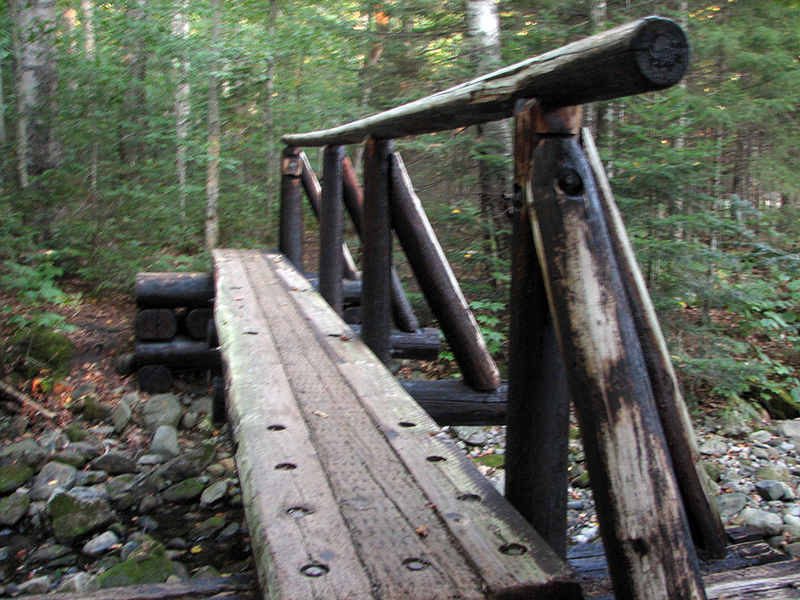 The Darmouth Outing Club is responsible for most of the trails on Moosilauke. 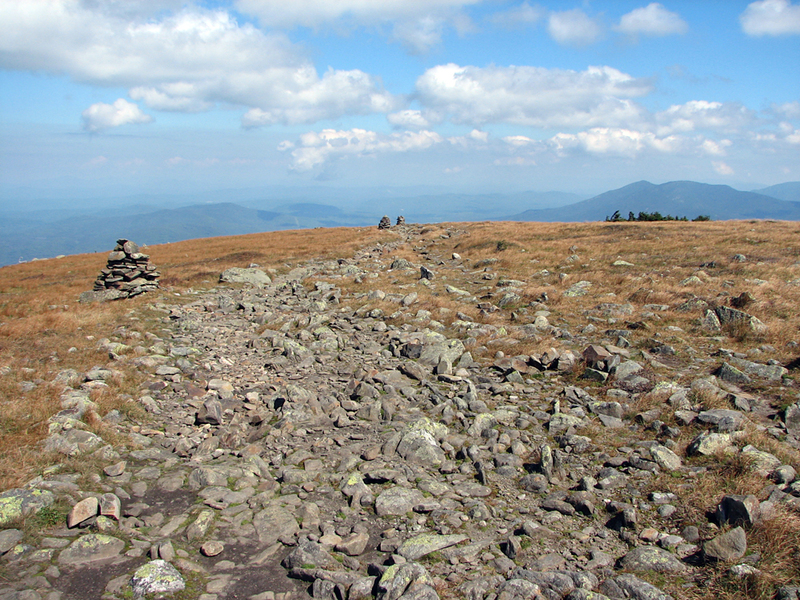 Broad, rounded, and grassy summit area on the approach to the top of Mt Moosilauke. 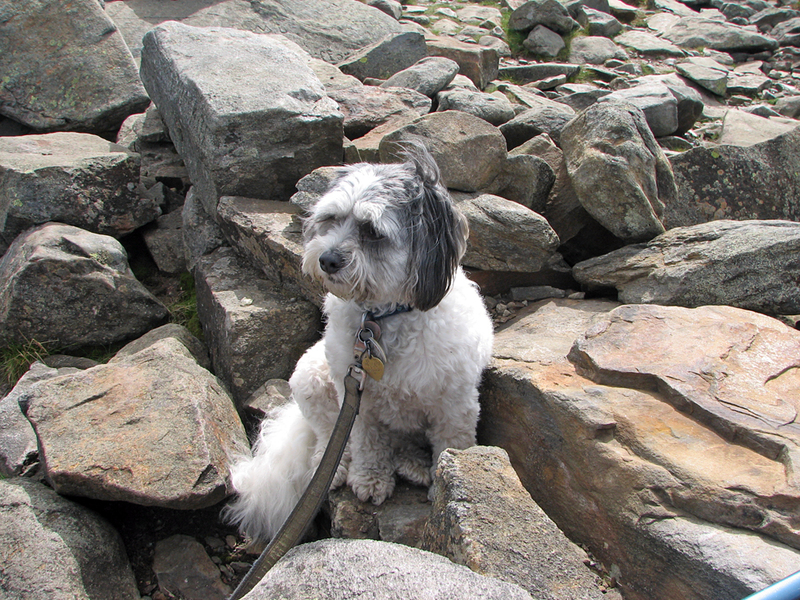 Patches resting in the rocks by foundation of the old summit house. 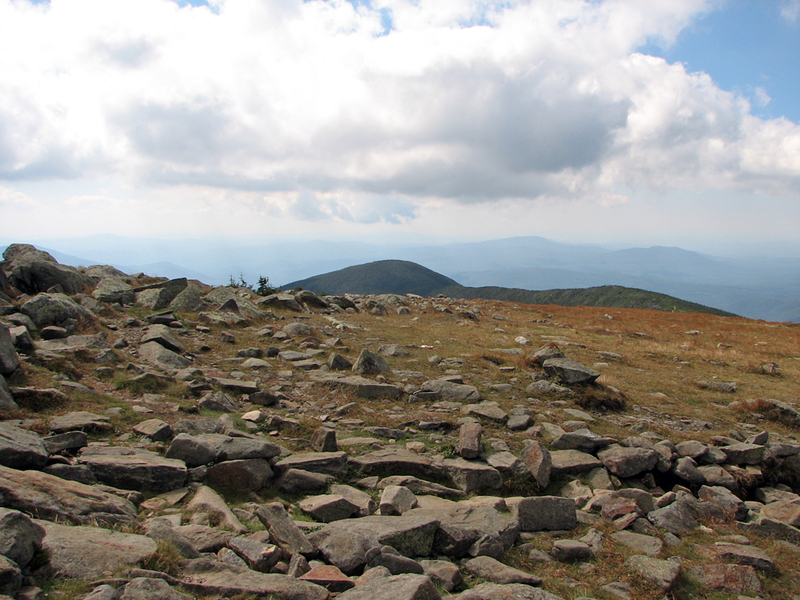 Looking southwest across the summit area with the top of Moosilauke's South Peak visisble just beyond. 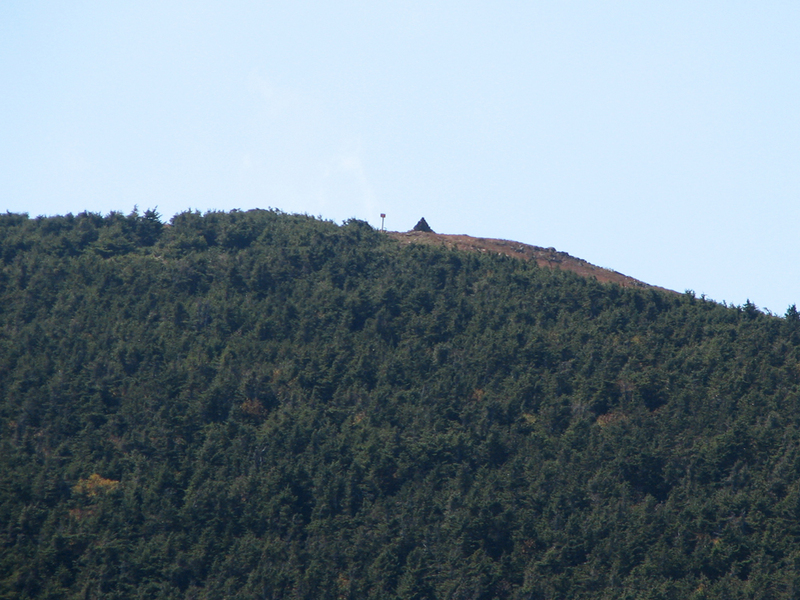 The distinctive orange signs at the summit of Mt Moosilauke. Hazy view northeast to Franconia Ridge with Mts Lafayette, Lincoln, Liberty and Flume. Self-portrait of Patches and myself. I took 6 or 7 pictures just to get this one where Patches is mostly looking at the camera. Looking down into Jobildunk Ravine from the Beaver Brook Trail near Mt Blue. 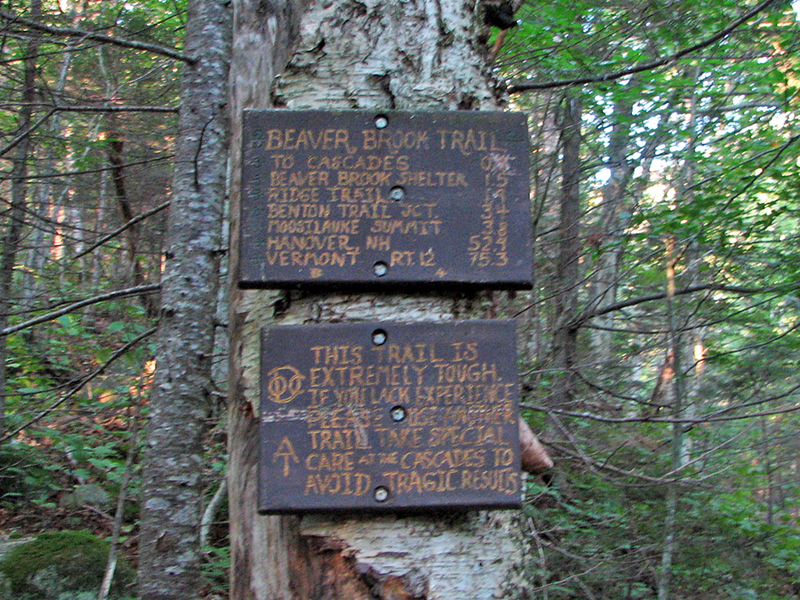 Looking back at a trail sign and cairn in the Moosilauke summit area the Beaver Brook Trail near Mt Blue.